Manchester area topographicals were the star performers at Warwick and Warwick’s 16 November auction; practically every collection offered realised more than estimate. A Hyde collection estimated at £1,150 sold for £1,947, a Glossop collection estimated at £800 sold for £1,298, an Oldham collection estimated at £650 sold for £1,180 and a Stretford collection estimated at £1,500 sold for £2,596. 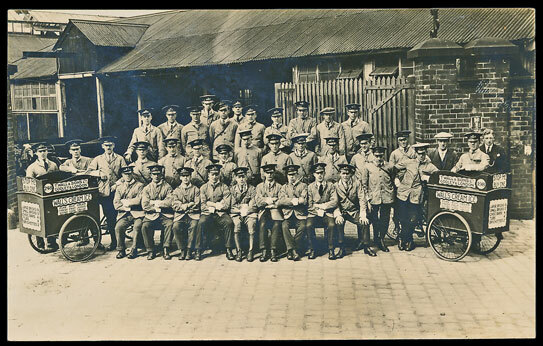 There were 2 Stockport collections, with estimates of £1,000 and £900. They realised £1,416 and £1,829 respectively. The single cards on offer achieved equally dramatic prices. An RP card of Godley (Hyde) Wall’s ice cream factory, 2 vending carts and staff and a second RP of an ice cream van realised £130. 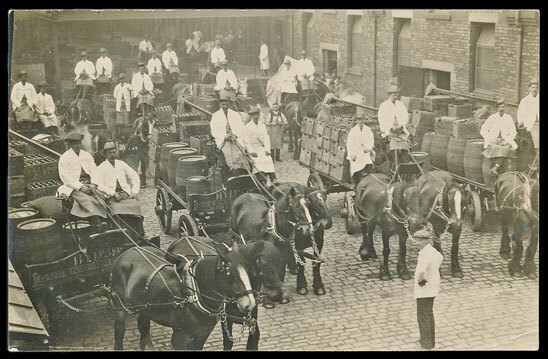 The Queen’s Brewery yard at Hyde featured no less than 10 horse drays and drivers and this fine RP made £88. 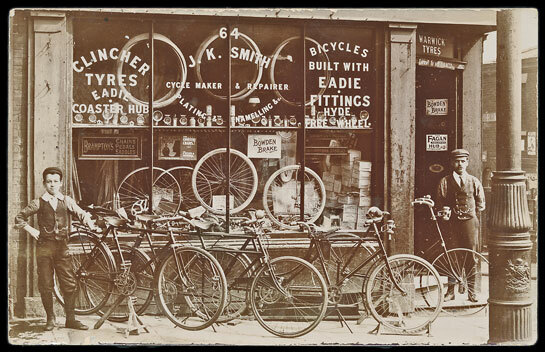 A wonderfully busy bicycle shop-front RP at Hyde achieved £112. 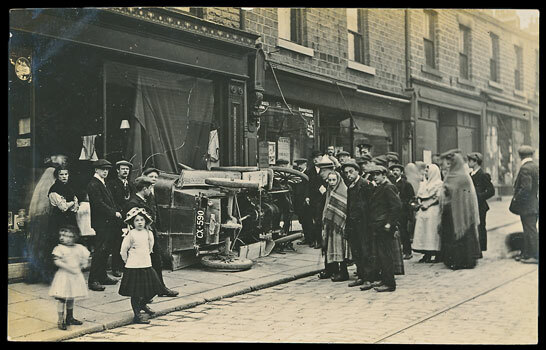 A Glossop 1913 motorcar accident on Station Road featured an overturned car with a Huddersfield registration. This fine RP made £77. 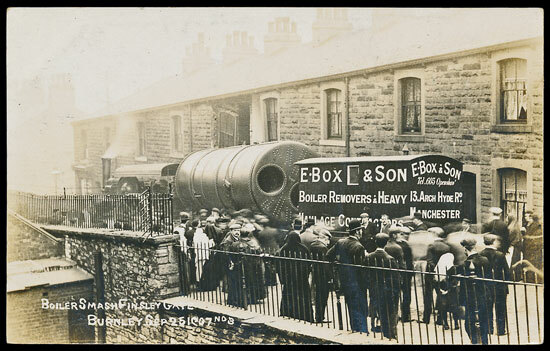 In 1907 a traction engine towing a large boiler on a trailer crashed into a terrace of houses at Finsley Gate,Burnley. An RP of the accident made £112. 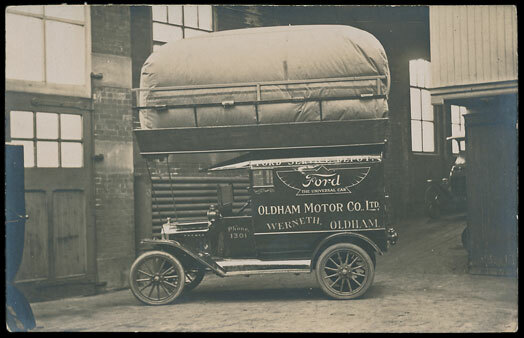 During World War I the Oldham Motor Co. converted their Ford van to run on gas, which was stored in a large sack on the roof rack. This RP card probably shows the van at their Werneth works. It realised £94. The second part of this dramatic Greater Manchester collection will be offered in Warwick and Warwick’s 18 January 2017 auction. Elsewhere in the sale, a comprehensive collection of Picturegoer film stars was very popular. They were offered as 5 lots, divided alphabetically, with estimates totalling £2,370. The final result was £5,841, or £1.40 per card. The Picturegoer Film Stills series realised more, at £1.89 per card. The best result of the day was the £5,310 paid for a collection of approx 650 RPs, with postcard backs, of traditionally rigged tall sailing ships, which included 16 shipwrecks. The cards were all apparently different and unused.